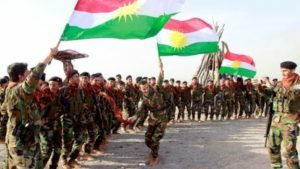 Iraq’s Kurds, who have long been one of the most effective fighting forces against Islamic State (ISIS), are “re-energized” in their bid for independence, a senior Kurdish official said. The Kurds, who already run their own autonomous region in northern Iraq, expect to hold a referendum on independence some time after ISIS is ousted from Mosul, said Hoshiyar Zebari, a senior member of the Kurdistan Democratic Party (KDP). The KDP and the Patriotic Union of Kurdistan (PUK) agreed at a meeting on April 2 that a referendum should be held this year, Zebari told Reuters. “The idea of a referendum has been re-energized,” Zebari, a former Iraqi foreign and finance minister, said in an interview in Erbil on April 5. Iraqi Kurdish independence has been historically opposed by Iraq as well as Iran, Turkey and Syria, as they fear the move would embolden their own Kurdish populations to seek autonomy. Iraq’s Kurds are the community to have advanced the most toward independence. Iraq has been led by the Shi’ites since the overthrow of Saddam Hussein, a Sunni, in 2003, following a U.S.-led invasion. The Kurds have played a major role in the U.S.-backed campaign to defeat ISIS. They have their own armed force, the Peshmerga, which prevented in 2014 Islamic State from capturing the oil region of Kirkuk, after the Iraqi army fled the battlefield. The Kurds have historical claims over Kirkuk, which is also inhabited by Turkmen and Arabs. Hardline Iranian-backed Iraqi Shi’ite militias have threatened to drive the Kurds by force from the region and other disputed areas. Kirkuk’s Kurdish-led provincial council rejected a resolution by the Iraqi parliament in Baghdad this week to lower Kurdish flags raised since last month next to Iraqi flags over public buildings of the region. Turkish President Tayyip Erdogan also warned the Kurds that failure to lower the Kurdish flags would damage their relations with Turkey. “We don’t agree with the claim ‘Kirkuk is for the Kurds’ at all. Kirkuk is for the Turkmen, Arabs and Kurds, if they are there. Do not enter into a claim that it’s yours or the price will be heavy. You will harm dialogue with Turkey,” he said at a rally in the Black Sea province of Zonguldak. The KRG government rejected the Iraqi and Turkish demands, arguing that the Kurds’ role in defending Kirkuk against ISIS justified the hoisting of their flag. “If it wasn’t for the Peshmerga, there would be neither Iraq’s flag in the city nor Kurdistan’s,” KRG Prime Minister Nechirvan Barzani told reporters in Erbil on April 5.